A Basement or Foundation inspection is more substantial than the “observable” structural inspection which is part of a Home Inspection. It includes documenting wall movement measurements. If you depend on inspector to detect foundation problems by just an observable inspection, you may discover structural issues when it comes time to sell your home years after you’ve moved in. If a problem or a symptom of a problem is observed during a home inspection, the home inspector will include a description of the problem in a written report and may recommend further evaluation. The Further Evaluation is a more reasonable step prior to paying a structural engineer to evaluate and provide a specification of repairs. Before you close, you need to consider whether or not repairs are needed now and who’s going to pay for them. One of the biggest concerns of home buyers and building buyers is the structure of the building. If you buy a building that has a structural defect, the fact that most buildings do not have structural defects is of little comfort. You want to know if the house or building you are considering purchasing is structurally sound. Some home buyers and building buyers believe structural defects are only a concern in older buildings. Other real estate purchasers feel they can find structural defects just by “looking carefully”. Still other building buyers feel that an old building that is still standing must have no structural defects. The fact is that most structural defects have only subtle symptoms. For example, a building buyer may not recognize floor joists or a sill plate with termite damage that needs $25,000 worth of repairs. Rot in ceiling joists or roof rafters can also be costly to repair, and may not be apparent when casually examining the building. The foundation refers to the brick, stone, concrete block, or poured concrete that is supported by the ground and supports the home or building. The foundation provides structural support, and keeps water, soil, animals, and insects from entering the basement or crawl space. Anderson Home Inspection LLC will evaluate the building’s foundation for you. You are also informed about the risk of water penetration into the basement. When repairs are needed, an expense analysis is provided in the inspection report. If the building that you are considering purchasing has a basement, you need to know if there is evidence of water or dampness in the basement. Most basements have at least a few stains, some rusted metal, and a dehumidifier. Some basements have a damp odor, although this may only be detectable during the humid summer months. Many home purchasers and building purchasers are concerned that water in the basement problems indicates a structural problem, such as a cracked foundation. Virtually all foundation walls have some cracks, so the penetration of water into the basement does not necessarily indicate a structural defect. 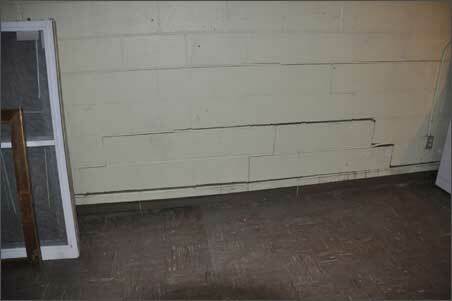 The Engineer will advise you as to whether cracks in the foundation walls are structurally significant. Most houses do not regularly have puddles of water in the basement, but are damp during some months of the year. If the basement is damp, it may affect your ability to build a finished room such as a playroom in the basement. Dampness in the basement is also a concern to people with allgies or other medical conditions because dampness can increase the risk of mold. A dehumidifier is often required in the basement to control the dampness. Why get a drain tile inspection? If your basement is showing signs of water or moisture problems; an interior drain tile inspection, or check, may be suggested or recommended. A drain tile inspection is a way to determine what type of interior drain tile system is present and to test how well it is currently functioning. A poorly functioning drain tile system can be a direct cause of water/moisture problems. If your house is up for sale and a home inspector sees signs of moisture in the basement, a drain tile check will often be recommended, even if the inspector suspects one or more other causes. This is primarily due to the time constraints of a realty transaction. Even though a quick fix of the grading or correcting downspouts may be all that’s needed to avoid future moisture issues in the basement, a pending transaction can’t wait to see if the quick fix will solve the problem. A drain tile check can be done in a couple of hours and quickly determine if the interior drain tile is a contributing factor. How is a Drain Tile Inspection done? A drain tile inspection generally consists of opening up at least three holes in different parts of the basement to check the condition of the interior tile and how well it is functioning. The tile is visually inspected for standing water, mud or other deposits, and tree roots. A water hose is then inserted into the tile to check for blockages, flow and pitch. This is all assuming a perimeter drain tile system is found in the basement. A perimeter system consists of tile placed next to the footing, around the inside edge of the basement, and connecting into a sump crock with a pump that discharges water outside onto the lawn or into the storm sewer. In some older homes, this is achieved by the drain tile directing the water through a palmer valve, generally at the floor drain. Other older homes may not have a perimeter system, but, rather, a web interior drain tile system. In a web system, interior tile runs directly from bleeders towards the floor drain where the tiles meet and connect to the side of the floor drain through a palmer valve. When drain tile is not found along the perimeter of the basement, typically an inspection hole is made near the floor drain at the anticipated junction point of these drain tile lines. This tile is then opened and visually inspected and a water hose is inserted in as many directions as possible in an attempt to detect possible deposits and blockages. It is difficult to adequately perform a drain tile test on a web drain tile system. A drain tile inspection may also be suggested if steel reinforcing tubes are going to be installed with no other work being done. If tubes are installed and then drain tile is found to need replacing later, those posts would need to be taken down and replaced with longer posts that would extend all the way down to the footing. A drain tile check under these circumstances could be looked at as an assurance of peace of mind. 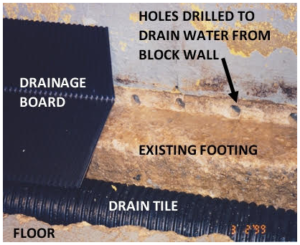 A drain tile – spud test is intended to determine if both the interior and exterior drain tile are functioning as well as some of the footing bleeders. To perform this test a pipe, or spud, is driven down to the level of the exterior drain tile. Water is then flushed through the spud in an effort to determine if the water makes it to the interior drain tile through the footing bleeders. This test is not always conclusive. Depending on soil conditions and other factors, water may never make it to the interior drain tile even if the drain tiles are working properly. In many cases, the unusual amount of water used, right next to the foundation for the test, may actually cause water seepage through the wall, that would not normally occur. This would have a direct negative impact on any future showings. Just because the drain tiles are working does not mean you will have a dry basement. Water can enter the wall before it gets to the drain tile system. If the basement has a block wall, water can become trapped in the hollows of the wall and then seep into the basement. Drain tile inspections are used by some companies as a sales tool. They suggest a drain tile check as a way of determining the problem. Part, or all, of the cost of the test is then offered off the price of a repair as enticement to sign a contract to work with them. First, determine what different options there are for repairing your particular problem. If the repair would involve replacing the interior drain tile no matter what condition it is in, there is no reason for spending good money on an interior drain tile check. Replacing the interior drain tile system in many cases is recommended not because the drain tile are hampered, but in conjunction with a bleeder system that drains water, that is trapped, in the block hollows to the drain tile. To prevent unnecessary repair by some unscrupulous contractors, you may be better off consulting a company that does independent inspections. Another option is to hire a contractor to do the inspection and tell him the work will be placed with some other contractor to insure the independence of his inspection.